Here we are doing our Friday post on Thursday again. This time it's because today is my birthday and I'm off on a little adventure tomorrow. My daughter has found a quote to go with this photo of the two of us from when she was a little girl. "No one else will ever know the strength of my love for you. After all, you're the only one who knows what my heart sounds like from the inside." -Anon. 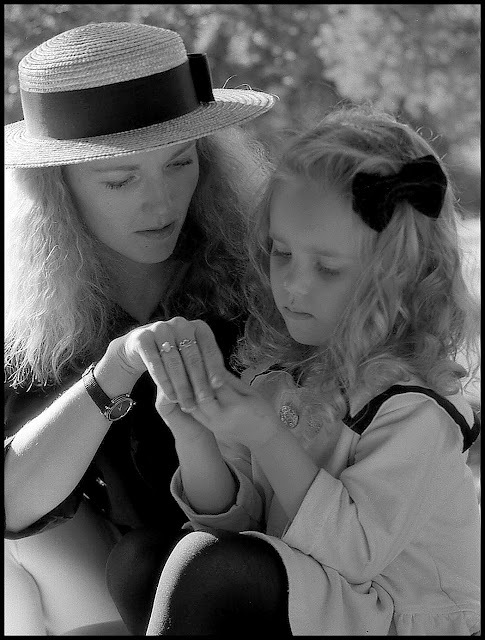 My mother took this photo of my daughter and me. We were sitting on the front porch, deep in some sort of conversation. One of us learning something from the other no doubt - some things never change. Enter the necklace giveaway here! Happiest of happy birthday wishes Gorgeous You! I hope you have a day filled with special surprises and lots of wonderful loving moments. PS: This is the most glorious photo of the two of you and I really love the quote. I love you so much. Happy birthday Momma! How perfect is this! Happiest of Happies! You KNOW how much this crew over here loves you! Mwah! Well done with the quote MJM! This is so beautiful!! Wishing you a Super Happy Birthday!!! I love this photo and the "girls" in it. Take it easy today, eat lunch! Awwww pass the kleenex, this one made me teary-eyed. Happy Birthday and wishing you a really fun day and weekend ! I teared up over this one! Happy birthday, you deserve the best of the best! Well I'm on catch up after London!! What a gorgeous shot of the two of you and I just love the quote - this is possibly my favorite "she read, she saw"!! And wishing you a belated and very Happy Birthday Jeanette! !